While on vacation in Pigeon Forge, TN, my wife and I decided to tackle some easy-to-moderate trail hikes in the Great Smoky Mountains National Park. Being spring break for many primary school students, the park was more crowded than usual. With that in mind, we decided to avoid all the paved trails which are typically popular for family hikes. While we had a few trails in mind, a stop at the Sugarlands Visotors' Center and a talk with one of the rangers proved vital to determining which trails we would ultimately traverse as the ranger provided previously unknown information like temporary road temporary road closures, likely crowd sizes and the types of things we might see on each trail. 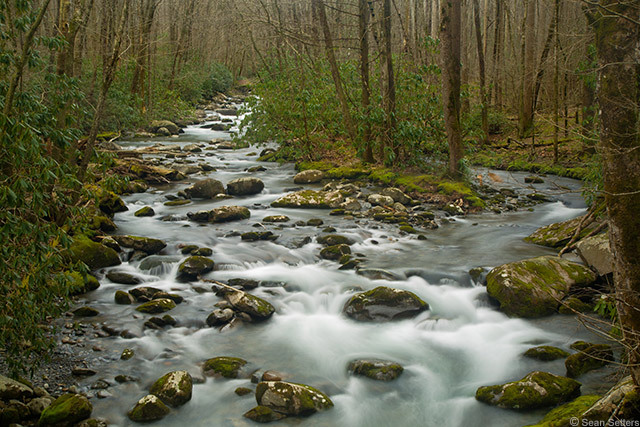 In the end, we settled on the Porters Creek Trail / Fern Branch Falls at Greenbrier and Cucumber Gap Loop at Elkmont. Photography was not a primary goal for these hikes; spending quality time with my wife who thoroughly enjoys hiking was. However, going on the hikes without a camera seemed unimaginable to me, so I decided to pack a small kit with the intent of pausing our hike periodically so that she could meditate to the tranquil sounds of the wind in the forest and the gently flowing creek. At least, that's how I sold the idea to her as she watched me pack my small camera backpack. I knew that our hikes would follow a couple of creeks and their smaller tributaries. I wanted to use long exposures to capture silky movement in the water, which meant that an ND filter was necessary. I decided to bring my Singh-Ray Vari-N-Duo filter because its variable neutral density filter and circular polarizer combination seemed well suited for photographing flowing water. Note that I didn't say "perfectly suited" as I own the standard version of the filter which is very thick (it extends .69" / 17.54mm from the end of the lens) and causes significant mechanical vignetting at focal lengths wider than roughly 50mm on the EF 24-105mm f/4L IS USM (mounted on a full frame EOS 5D Mark III) that I took with me. In short, the tradeoff for getting an ND + polarizing effect was the loss wide angles of view. Using exposures long enough to capture ample motion blur in the water necessitated a stabilized camera, and that meant I needed to bring a tripod or alternate method of stabilization. My primary tripod and head weigh in at nearly 6.5 lb (2.9 kg) and when compacted, are still 27.75" (70.49 cm) long. The size and weight of the tripod made it an inconvenient and cumbersome choice for the hikes, especially considering the small camera backpack I planned to take on the trips. In place of the primary tripod I opted to take my Feisol TT-15 Carbon Fiber Tabletop Tripod. Even with a small travel-style ball head attached, the tripod and head weigh less than 1 lb (0.45 kg) and are only 8.38" (21.29 cm) long when folded down. The combo's small size and minimal weight made carrying the tripod a breeze yet it allowed me to capture the long exposures I was hoping to get. That said, there was one significant drawback to the diminutive tripod, which is that the framing and composition options available at any given time depended on the surfaces (and especially the height of those surfaces) available at any specific location. There were several locations that I thought looked interesting but couldn't find a suitable platform high enough to get the composition I wanted. 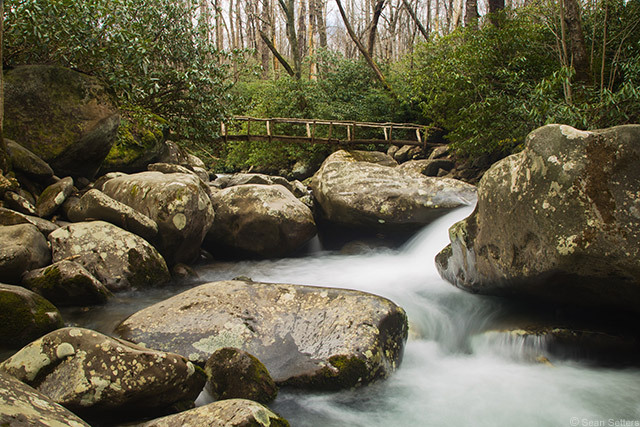 But in most cases along the Smoky Mountain Trails we traversed, a large rock bordering (or in) the water or a fallen tree trunk provided a sufficiently high enough platform for pleasing compositions. In the end, I was extremely happy I had the Feisol TT-15 Tabletop Tripod in my kit. Consider picking one up if you plan on hiking moderate-to-long distances and want to reduce the weight you bear with every step.